Here we have some of the rarest and most collectable Knife Rests you could find. They range from what is considered to be a completely one-off set of Bass Guinness Rests to a set that symbolised the struggle between the British and The Boers in South Africa in the late nineteenth century. Very unusual, believed to be unique. Exceptional quality in the original satin lined case but with some slight age "spotting" on the bases. Bottles are labelled with Bass and Guinness logo's. The mark RD.20953 gives them a date of 1885-86 Makers T.W.&S. with a stork impression in a shield. Very unusual and well plated with a monogrammed base. (AHC) in very old english script. Perfect condition and finely detailed quality. The plating is in excellent condition with the date circa 1900 at the very latest. The figure which is the same on all of the rests is thought to be Moses. Very ornate,silver plated and in excellent condition. Superb detail on both sides of the swans almost in original state. Extremely ornate, well plated, symbolising the struggle over the Boer War. Knife rests and Napkin rings in own box. Talbot Hounds with riding crop centre piece. Silver plating in excellent condition. 3.5" long x 2.5" high. Twisted centre bar with detailed club markings. Elkington and Co. Mid 19th Century. Base 4.25" x 2.25", lions 2" high. Excellent heavy quality, most desirable. Heavily engraved base with finely detailed lions in silver plate. In superb condition for their age estimated to be early 20th century. 4.25" long x 2" high. Set of 4 Silver plated bases with horn inserts. Little boys sitting on gates with straight engraved centre. Believed to be late nineteenth/early 20th century. Well plated with square bar centre piece and good detail on the sphynx. Elegently engraved classic post first world war design. RD No. 667120 engraving gives them a date of 1919-1920. Superbly plated and in extremely fine condition. 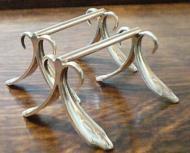 Large carvers, well plated with ball feet and elegant twisted centres in excellent condition. Thought to be early twentieth century. The plating is in excellent condition. Makers mark:HA EA FA standing for Henry, Edward & Frank Atkin signifying that they are well made and heavily plated rests. Extremely good condition with rosettes on the end of each large ball. Shaped collar at each end of twisted centre stem connected to main ball ends. The feet are also balls. Rd.No. 111097 giving them a date of 1888. Very nice and unusual design in very good condition and thought to be victorian. Good condition and well plated. Squared centre with beaded decoration.and diamond shaped bases. Registered diamond engraving gives the date to 1871. Extremely good condition consistent with their age with no major faults. Very ornate "A" ends with sectioned centre stem. Very good condition apart from one small area on inner face of one end which is barely noticeable. Although not marked the design is very reminiscent of John Gough circa 1890. Extremely well silver plated on brass in perfect condition. Beautiful balled ends with a finely engraved centre. Late Victorian or early twentieth century. Excellent condition and very unusual subject. Elegantly composed shield ends with engraving detail on the feet. Suitable for monogramming as gift. Silver plated on brass, showing slight signs of their age thought to be late Victorian. Fine engraved centre stem giving an overall attractive item. Size 3.5" long x 1.5" high. Set of 6 French Christofle rests. Each marked with import control mark and in excellent condition. Rose motif at each end. Plating showing signs of age which is thought to be late Victorian. Silver on brass with a very fancy centre stem. Very ornate ends in extremely good condition with squared centre piece. All in excellent condition with heavily twisted centre piece connected to ball ends and with ball feet. Flat ends in good condition and diamond shaped middle, They have monogrammed ends (H.E.P). Made by H T & S.
Fancy pierced ends with plain centre piece.